It’s with the greatest joy we announce our month of April special! For the entire duration of April, we are offering a R2000 per night discount on all bookings. TCs apply – Discount only applies to bookings made between 1 – 30 April 2019 | Minimum two (2) night stay | Bookings are dependent on availability. 11 On Fairway is a true 5-star luxury beach villa. Expect to be treated like royalty while enjoying unmatched service from the moment you arrive. We are situated on the 3rd hole of the world-renowned Southbroom golf course. Each of our exquisite bedrooms offers breathtaking views of the lush and tropical golf course as well as tranquil beach and ocean views. 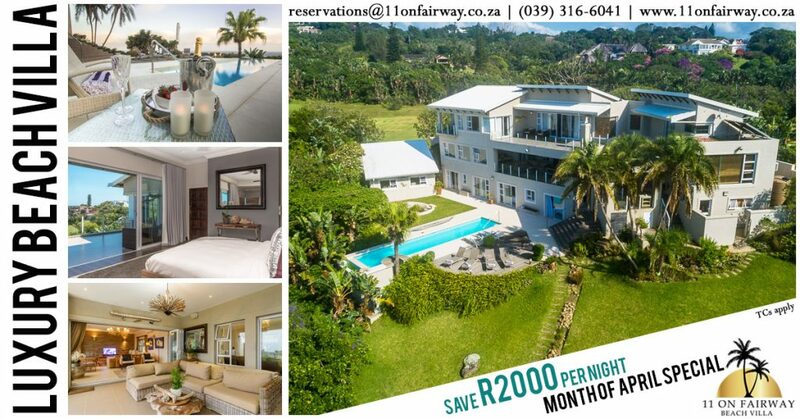 reservations@11onfairway.co.za | (039) 316-6041 | Call or WhatsApp on (071) 408-0093 | Directions.